Who doesn’t love modern technology? Laptops, computers, smartphones, tablets, and myriad other gadgets facilitate our lives in tremendous ways. Unfortunately, there is a rather frightening host of downsides to becoming more tech-savvy. Take smartphones, for example. There are over 1.6 million driving accidents alone due to smartphones — more than 300,000 injuries, and 11 horrible teen deaths every single day. Today, toddlers, grandparents, and everyone in between use smartphones, leading to detrimental effects in health and social skills. There are also many dangers to letting children use phones that parents and adults should know about. In an exclusive guide below, we’ll talk about a few of the most recognized dangers associated with using smartphones. Scroll on to find out how using smartphones can gravely affect your life, and what you can do to remedy this. Let us know your thoughts in the comments below! Most of us think that we’re pretty careful when we go for a ride or a walk outside. In fact, we’re so confident in our ability to focus, that we often use our smartphones simultaneously. The truth, however, is that this makes us reckless. According to studies conducted by the National Accident Helpline in the U.K., 43 percent of regular smartphone users have actually walked straight into a wall or object while checking their phone. Pedestrians who text are generally four times more likely to be unaware of street signs and traffic lights. What’s more, there are over 1.5 million people who end up in the hospital every year because they dared to text behind the wheel. Many of us suffer from posture-related disorders like carpal tunnel syndrome, even if we don’t know it. Maintaining a certain position for prolonged periods of time can be seriously detrimental to everything from the muscles and tendons to the nerves. 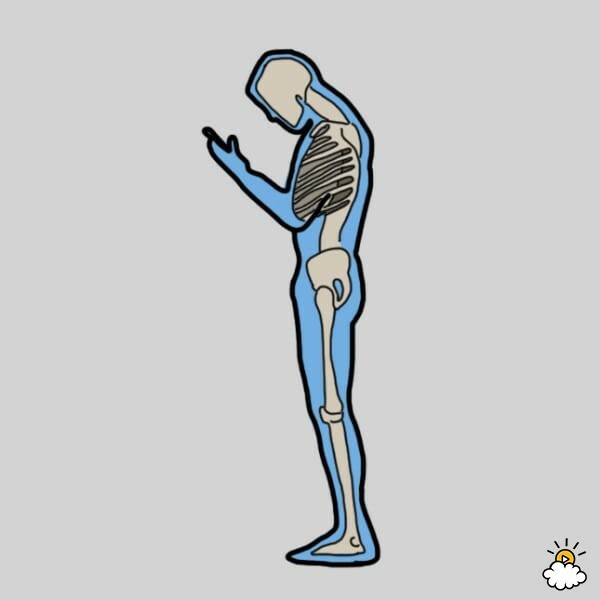 If you’re looking at your phone for hours at a time, chances are, your arms are lifted in an unnatural position, and your neck is bent. According to Dr. Joseph Mercola, M.D., an osteopathic physician, those who are fixated on their phones are more likely to develop pain, muscle spasms, and chronic diseases. Fixing your eyes on a small phone screen for long periods of time can certainly be dangerous. Screen fatigue is an absolutely horrible feeling. Your eyes, forehead, and temples will throb and hurt, sometimes for hours on end. To avoid this, never strain your eyes for too long, or you’ll be at risk of developing irritating conditions, like dry eye syndrome. In a startling study, researchers at Carnegie Mellon University discovered that those who use their phones and listen to people talk at the same time exhibit a 37 percent loss of brain activity. Sadly, other studies have proven the same thing: the more attached you are to your phone, the shorter your attention span and ability to focus. This will make you much less effective at completing detailed tasks, or concentrating on a conversation. Many of us take our phones to bed. Whether it’s to watch a funny video, or perhaps to type that last email, phone use before bedtime is a common practice. What we may not realize, however, is that these brightly lit screens can in fact suppress melatonin production, and cause a host of sleeping problems, like insomnia. It can also make you hyper-alert — but not in a good way. “Looking at screens engages you in intellectual activity that is not at all like reading a book. It puts you in a state of alertness, which is the last thing you want to be before going to bed,” said Professor Kevin Morgan, of the sleep research unit at Loughborough University. Smartphones can greatly alter our social behavior. Even though this is a gradual development, it can still prove to be dangerous. Many kids and teenagers lack sufficient social skills because they spend way too much time on their phones. They become obsessed with their electronics, and disconnected with the world around them. Parents, however, can also be greatly affected by phones, and negatively impact the kids. “Children learn by watching us how to have a conversation, how to read other people’s facial expressions,” said pediatrician Dr. Jenny Radesky. Many in the U.S. have experienced dangers like financial theft, spyware, and leakage of important personal information because of smartphones. When you browse the internet from your phone, you may not always be protected by a firewall or an antivirus, thereby putting your device at risk. Because we may forget to log out on our phones, our many passwords and ID numbers may still be stored as data on the phone. A skilled hacker or strong virus may then very easily steal or leak important information, photos, and personal data. This is what we look like when we stare at our phones. The neck inches forward, the shoulders round or lift upward, and, most notably, the neck and shoulder muscles spasm and contract. Until just a few years ago, the term “text neck” had never been heard of. Today, it’s becoming quite a severe chronic condition experienced by young and old alike. Many people experience horrid back pain and repetitive strain injuries, all because they sit and stare at their phones for way too long. Try not to hunch over your smartphones if you want to avoid pestering muscle pain, and strained spinal discs. Please SHARE these crucial tips to using smartphones with friends and family! 12 SIGNS YOU ACTUALLY ENJOY BEING ALONE..
19 Uses For Vaseline You Didn’t Know!